Finished The Quilt On My Zelda Commission! I finished it last night about midnight and I was too lazy to set up lighting to take pictures. Instead I plopped down on my bed and watched a Netflix Movie until I fell asleep. Here are the pictures. 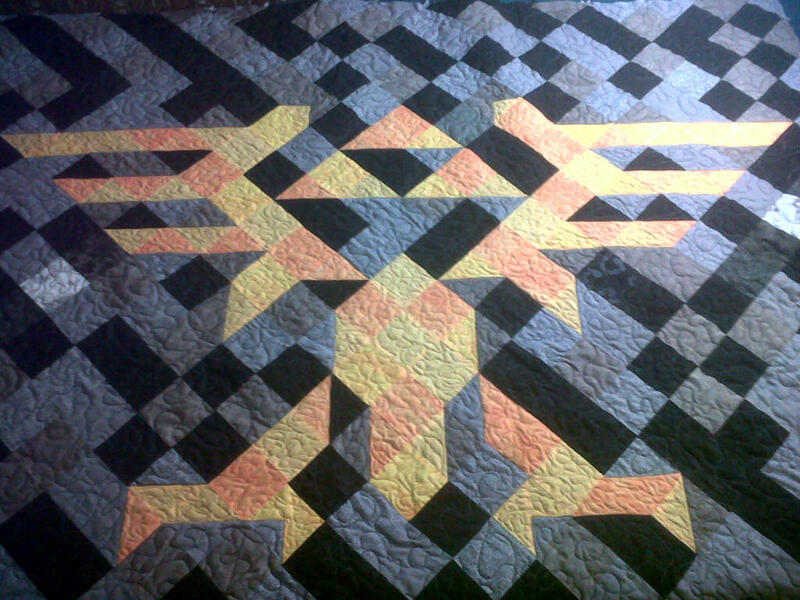 For the quilting I ended up doing black and grey stippling on the background, and then yellow and orange stippling on the actual bird. I hope the client likes it! I’ll bind it later today! First though, I have to go and return a pair of shoes I ordered online. Damn things didn’t fit right! I swear, my shoe size goes from 13 Wide to 16 Narrow depending on the shoe! Beautiful quilt. I’m sure the client will love it.